This piece of original art is currently for sale. 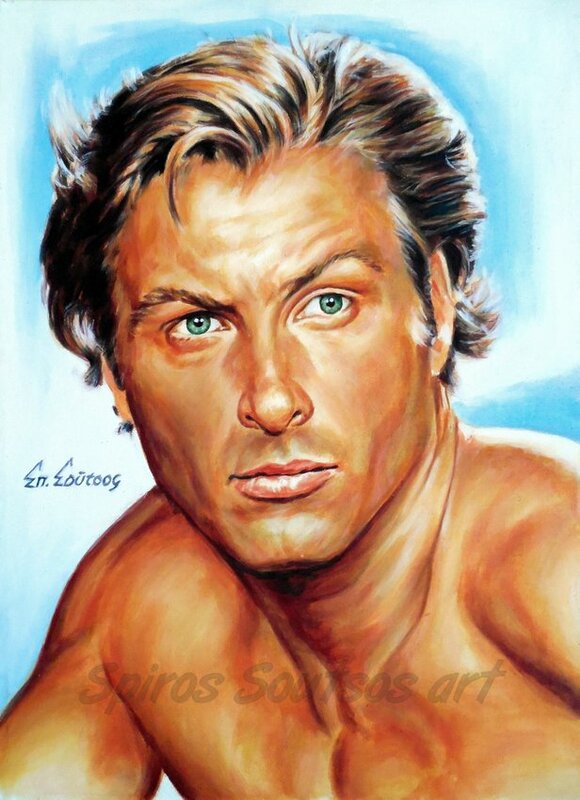 Lex Barker born on 8th of May 1919 was an American actor best known for playing Tarzan of the Apes role in cinema. In February 1941, ten months before the attack on Pearl Harbor, Barker enlisted in the US Army. He rose to the rank of major during the war. He was wounded in action (in the head and leg) fighting in Sicily. Back in the USA, he traveled to Los Angeles. Within a short time, he landed a small role in his first film, Doll Face (1945). A string of small roles followed, but he soon found the role that would bring him fame. In Tarzan’s Magic Fountain (1949), Barker became the tenth official Tarzan of the movies. 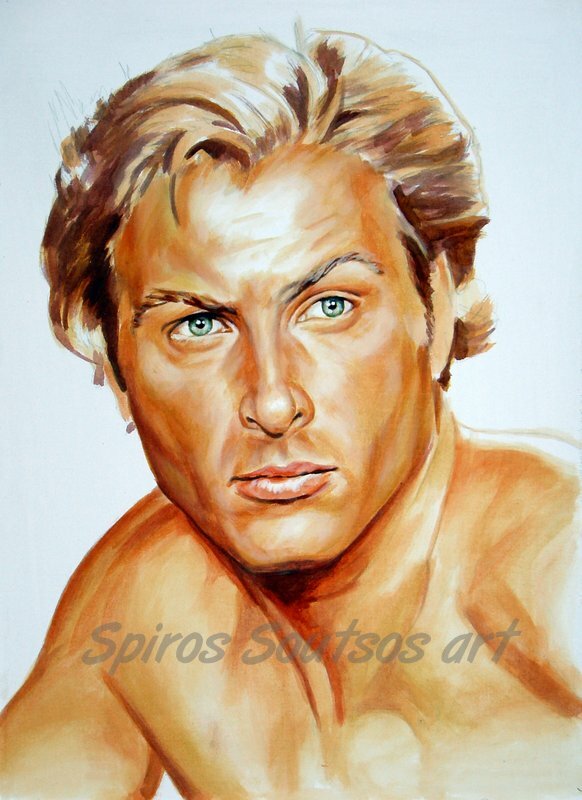 His blond, handsome, and intelligent appearance, as well as his athletic, now 6’4″ frame, helped make him popular in the role Johnny Weissmuller had made his own for sixteen years. Barker made only five Tarzan films, but he remains one of the actors best known for the role. In 1957, as he found it harder to find work in American films, Barker moved to Europe (he spoke French, Italian, Spanish, and some German), where he found popularity and starred in over forty European films, including two movies based on the novels by Italian author Emilio Salgari (1862–1911). In Italy, he also had a short but compelling role as Anita Ekberg‘s fiancé in Federico Fellini‘s La Dolce Vita (1960). In Germany, he had his greatest success. There he starred in two movies based on the “Doctor Mabuse” stories (formerly filmed by Fritz Lang), in the movies Frauenarzt Dr. Sibelius and Frühstück im Doppelbett, and in 12 movies based on novels by German author Karl May (1842–1912). In 1966, Barker was awarded the “Bambi Award” as “Best Foreign Actor” in Germany, where he was a major, very popular, star. He returned to the United States occasionally and made a handful of guest appearances on American television episodes. But Europe, and especially Germany, was his professional home for the remainder of his life. Barker was married five times. In 1951 he married his second wife, the actress Arlene Dahl and divorced her in1952. His third wife was the famous actress Lana Turner (married September 8, 1953–divorced July 22, 1957). Barker died three days after his 54th birthday, in 1973, of a heart attack while walking down a street in New York City on his way to meet his fiancée, actress Karen Kondazian.